I was working on editing a book on a computer screen that was black in 10 columns wide. That made it difficult to read. Then I was attempting to take the text from the 2nd column and place it under the text in the first column where it belonged. I would have to continue to do that to nake the text readable. While I was doing that, I saw the text was overstruck and the word OKLAHOMA becamr completely obliterated. I looked at the black computer screen that was supposed to be edited similar to yesterday. All of a sudden the whole screeen shifted, but still black, I saw the whole United States map with the states outlined in white, and right in the center, there was a large white oval surrounding the state of Oklahoma. NOTE: After I woke up, I looked up "Oklahoma earthquakes"
There were 2132 quakes in the last year. Evidendently something dire is happening there. In chemistry, pH (/piːˈeɪtʃ/) is a numeric scale used to specify the acidity or alkalinity of an aqueous solution. It is roughly the negative of the logarithm to base 10 of the concentration, measured in units of moles per liter, of hydrogen ions. More precisely it is the negative of the logarithm to base 10 of the activity of the hydrogen ion. Solutions with a pH less than 7 are acidic and solutions with a pH greater than 7 are alkaline or basic. Pure water is neutral, being neither an acid nor a base. Contrary to popular belief, the pH value can be less than 0 or greater than 14 for very strong acids and bases respectively. pH measurements are important in medicine, biology, chemistry, agriculture, forestry, food science, environmental science,oceanography, civil engineering, chemical engineering, nutrition, water treatment & water purification, and many other applications. The pH scale is traceable to a set of standard solutions whose pH is established by international agreement. Primary pH standard values are determined using a concentration cell with transference, by measuring the potential difference between a hydrogen electrode and a standard electrode such as the silver chloride electrode. The pH of aqueous solutions can be measured with a glass electrode and a pH meter, or indicator. pH is the negative of the logarithm to base 10 of the activity of the (solvated) hydronium ion, more often (albeit somewhat inaccurately) expressed as the measure of the hydronium ion concentration. The rest of this article uses the technically correct word "base" and its inflections in place of "alkaline", which specifically refers to a base dissolved in water, and its inflections. Indicators may be used to measure pH, by making use of the fact that their color changes with pH. Visual comparison of the color of a test solution with a standard color chart provides a means to measure pH accurate to the nearest whole number. More precise measurements are possible if the color is measured spectrophotometrically, using a colorimeter ofspectrophotometer. Universal indicator consists of a mixture of indicators such that there is a continuous color change from about pH 2 to pH 10. Universal indicator paper is made from absorbent paper that has been impregnated with universal indicator. So, at room temperature pOH ≈ 14 − pH. However this relationship is not strictly valid in other circumstances, such as in measurements of soil alkalinity. Measurement of pH below about 2.5 (ca. 0.003 mol dm−3 acid) and above about 10.5 (ca. 0.0003 mol dm−3 alkaline) requires special procedures because, when using the glass electrode, the Nernst law breaks down under those conditions. Various factors contribute to this. It cannot be assumed that liquid junction potentials are independent of pH. Also, extreme pH implies that the solution is concentrated, so electrode potentials are affected by ionic strength variation. At high pH the glass electrode may be affected by "alkaline error", because the electrode becomes sensitive to the concentration of cations such as Na+ and K+ in the solution. Specially constructed electrodes are available which partly overcome these problems. Runoff from mines or mine tailings can produce some very low pH values. where μH+ is the chemical potential of the hydrogen ion, μoH+ is its chemical potential in the chosen standard state, R is the gas constant and T is the thermodynamic temperature. Therefore pH values on the different scales cannot be compared directly, requiring an intersolvent scale which involves the transfer activity coefficient of hydrolyonium ion. pH is an example of an acidity function. Other acidity functions can be defined. For example, the Hammett acidity function, H0, has been developed in connection with superacids. The concept of "Unified pH scale" has been developed on the basis of the absolute chemical potential of the proton. This scale applies to liquids, gases and even solids. Pure water is neutral. When an acid is dissolved in water, the pH will be less than 7. When a base, or alkaline, is dissolved in water, the pH will be greater than 7. A solution of a strong acid, such as hydrochloric acid, at concentration 1 mol dm−3 has a pH of 0. A solution of a strong alkaline, such as sodium hydroxide, at concentration 1 mol dm−3, has a pH of 14. Thus, measured pH values will lie mostly in the range 0 to 14, though negative pH values and values above 14 are entirely possible. Since pH is a logarithmic scale, a difference of one pH unit is equivalent to a tenfold difference in hydrogen ion concentration. The pH of an aqueous solution of a salt such as sodium chloride is slightly different from that of a neutral solution, even though the salt is neither acidic nor basic. This is because the hydrogen and hydroxide ions' activity is dependent on ionic strength, so Kw varies with ionic strength. Pure water does not contain any ions and therefore cannot have a pH value (log(0) is infinity). however, if pure water is exposed to air it becomes mildly acidic. This is because water absorbs carbon dioxide from the air, which is then slowly converted into carbonate and hydrogen ions (essentially creating carbonic acid). pH-dependent plant pigments that can be used as pH indicators occur in many plants, including hibiscus, red cabbage (anthocyanin) and red wine. The juice of citrus fruits is acidic mainly because it contains citric acid. Other carboxylic acids occur in many living systems. For example, lactic acid is produced by muscle activity. The state of protonation of phosphate derivatives, such as ATP, is pH-dependent. The functioning of the oxygen-transport enzyme hemoglobin is affected by pH in a process known as the Root effect. The pH of seawater plays an important role in the ocean's carbon cycle, and there is evidence of ongoing ocean acidification caused by carbon dioxide emissions. However, pH measurement is complicated by the chemical properties of seawater, and several distinct pH scales exist in chemical oceanography. However, it is difficult to estimate KS* in seawater, limiting the utility of the otherwise more straightforward free scale. However, the advantage of considering this additional complexity is dependent upon the abundance of fluoride in the medium. In seawater, for instance, sulfate ions occur at much greater concentrations (>400 times) than those of fluoride. As a consequence, for most practical purposes, the difference between the total and seawater scales is very small. In practical terms, the three seawater pH scales differ in their values by up to 0.12 pH units, differences that are much larger than the accuracy of pH measurements typically required, in particular, in relation to the ocean's carbonate system. Since it omits consideration of sulfate and fluoride ions, the free scale is significantly different from both the total and seawater scales. Because of the relative unimportance of the fluoride ion, the total and seawater scales differ only very slightly. The pH of different cellular compartments, body fluids, and organs is usually tightly regulated in a process called acid-base homeostasis. The most common disorder in acid-base homeostasis is acidosis, which means an acid overload in the body, generally defined by pH falling below 7.35. Alkalosis is the opposite condition, with blood pH being excessively high. The pH of blood is usually slightly basic with a value of pH 7.365. This value is often referred to as physiological pH in biology and medicine. Plaque can create a local acidic environment that can result in tooth decay by demineralization. Enzymes and other proteins have an optimum pH range and can become inactivated or denatured outside this range. The calculation of the pH of a solution containing acids and/or bases is an example of a chemical speciation calculation, that is, a mathematical procedure for calculating the concentrations of all chemical species that are present in the solution. The complexity of the procedure depends on the nature of the solution. For strong acids and bases no calculations are necessary except in extreme situations. The pH of a solution containing a weak acid requires the solution of a quadratic equation. The pH of a solution containing a weak base may require the solution of a cubic equation. The general case requires the solution of a set of non-linear simultaneous equations. where [H+] stands for the concentration of the aqueous hydronium ion and [OH−] represents the concentration of the hydroxide ion. This equilibrium needs to be taken into account at high pH and when the solute concentration is extremely low. Strong acids and bases are compounds that, for practical purposes, are completely dissociated in water. Under normal circumstances this means that the concentration of hydrogen ions in acidic solution can be taken to be equal to the concentration of the acid. The pH is then equal to minus the logarithm of the concentration value.Hydrochloric acid (HCl) is an example of a strong acid. The pH of a 0.01M solution of HCl is equal to −log10(0.01), that is, pH = 2. Sodium hydroxide, NaOH, is an example of a strong base. The p[OH] value of a 0.01M solution of NaOH is equal to −log10(0.01), that is, p[OH] = 2. From the definition of p[OH] above, this means that the pH is equal to about 12. For solutions of sodium hydroxide at higher concentrations the self-ionization equilibrium must be taken into account. Self-ionization must also be considered when concentrations are extremely low. Consider, for example, a solution of hydrochloric acid at a concentration of 5×10−8M. The simple procedure given above would suggest that it has a pH of 7.3. This is clearly wrong as an acid solution should have a pH of less than 7. Treating the system as a mixture of hydrochloric acid and the amphoteric substance water, a pH of 6.89 results. A weak acid or the conjugate acid of a weak base can be treated using the same formalism. and its value is assumed to have been determined by experiment. This being so, there are three unknown concentrations, [HA], [H+] and [A−] to determine by calculation. Two additional equations are needed. One way to provide them is to apply the law of mass conservation in terms of the two "reagents" H and A. C stands for analytical concentration. In some texts one mass balance equation is replaced by an equation of charge balance. This is satisfactory for simple cases like this one, but is more difficult to apply to more complicated cases as those below. Together with the equation defining Ka, there are now three equations in three unknowns. When an acid is dissolved in water CA = CH = Ca, the concentration of the acid, so [A] = [H]. After some further algebraic manipulation an equation in the hydrogen ion concentration may be obtained. Solution of this quadratic equation gives the hydrogen ion concentration and hence p[H] or, more loosely, pH. This procedure is illustrated in an ICE table which can also be used to calculate the pH when some additional (strong) acid or alkaline has been added to the system, that is, when CA ≠ CH. For example, what is the pH of a 0.01M solution of benzoic acid, pKa = 4.19? Step 2: Set up the quadratic equation. In this case the resulting equation in [H] is a cubic equation. Some systems, such as with polyprotic acids, are amenable to spreadsheet calculations. With three or more reagents or when many complexes are formed with general formulae such as ApBqHr the following general method can be used to calculate the pH of a solution. For example, with three reagents, each equilibrium is characterized by and equilibrium constant, β. Note that there are no approximations involved in these equations, except that each stability constant is defined as a quotient of concentrations, not activities. Much more complicated expressions are required if activities are to be used. There are 3 non-linear simultaneous equations in the three unknowns, [A], [B] and [H]. Because the equations are non-linear, and because concentrations may range over many powers of 10, the solution of these equations is not straightforward. However, many computer programs are available which can be used to perform these calculations. There may be more than three reagents. The calculation of hydrogen ion concentrations, using this formalism, is a key element in the determination of equilibrium constantsby potentiometric titration. Almost all the quakes are north of Oklahoma city between Woodward on the west and PoncoCity on the east with a few toward Tulsa, OK. Here are the oil disposal water dumping wells along with the location of the earthquakes. This map is from 2014 along with the blue oil disposal well locations. Evidently the state is aware of the problem, but are they doing anything about it? HERE IS THE SCIENTIFIC EXPLANATION. YOU WILL NOT SEE ONE WORD EXPRESSED ON HOW PEOPLE AND ANIMALS ARE SUPPOSED TO LIVE WITH THIS DESTRUCTION. rising from an average of 24 M ≥3 earthquakes per year in the years 1973–2008 to an average of 193 M ≥3 earthquakes in 2009–2014, with 688 occurring in 2014 alone. 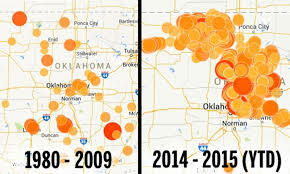 Multiple damaging earthquakes have occurred during this increase including the 2011 M 5.6 Prague, Oklahoma, earthquake; the 2011 M 5.3 Trinidad, Colorado, earthquake; and the 2011 M 4.7 Guy-Greenbrier, Arkansas, earthquake. The increased seismicity is limited to a few areas and the evidence is mounting that the seismicity in many of these locations is induced by the deep injection of fluids from nearby oil and gas operations. Earthquakes that are caused by human activities are known as induced earthquakes. Most injection operations, though, do not appear to induce earthquakes. Although the message that these earthquakes are induced by fluid injection related to oil and gas production has been communicated clearly, there remains confusion in the popular press beyond this basic level of understanding. The evidence that shows that wastewater injection is the primary cause of the large change in seismicity observed in the United States. This meets our expectations of how seismicity should behave. Finally, we discuss the possibility of mitigating this hazard. This article focuses on the recent seismicity induced by fluid injection; we are not aiming to provide a broad review of induced seismicity. Many articles in this vein have already been written (Nicholson and Wesson, 1990, 1992; McGarr et al., 2002; Ellsworth, 2013). The media commonly report on induced earthquakes incorrectly, and consequently policy makers and the public have an incorrect or incomplete understanding of how and why they occur. Here, we list common misconceptions about induced earthquakes and then correct them. 1. 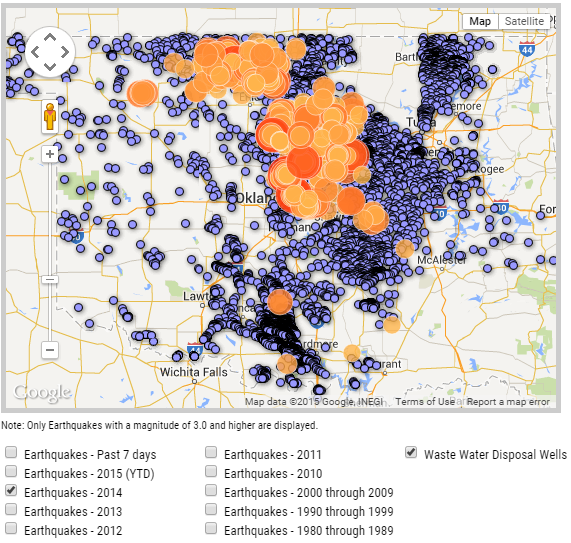 Misconception: Hydraulic fracturing is causing all of the induced earthquakes. Correction: Hydraulic fracturing is directly causing a small percentage of the felt-induced earthquakes observed in the United States. In contrast, felt earthquakes induced during hydraulic fracturing operations are more common in western Canada. Most induced earthquakes in the United States are a result of the deep disposal of fluids (wastewater) related to oil and gas production. 2. Misconception: The wastewater injected in disposal wells is spent hydraulic fracture fluid. Correction: The amount of spent hydraulic fracturing fluid injected into wastewater disposal wells is highly variable. The fluids disposed of near earthquake sequences in Youngstown, Ohio, and Guy, Arkansas, are believed to consist largely of spent hydraulic fracturing fluid (Horton, 2012; Kim, 2013). In contrast, in Oklahoma spent hydraulic fracturing fluid represents 10% or less of the fluids disposed of in salt-water disposal wells in Oklahoma (Murray, 2013). The vast majority of the fluid that is disposed of in disposal wells in Oklahoma is produced water. Produced water is the salty brine from ancient oceans that was entrapped in the rocks when the sediments were deposited. This water is trapped in the same pore space as oil and gas, and as oil and gas is extracted, the produced water is extracted with it. Produced water often must be disposed in injection wells because it is frequently laden with dissolved salts, minerals, and occasionally other materials that make it unsuitable for other uses. 3. Misconception: There would be no need for wastewater disposal if hydraulic fracturing was not used. Correction: Salt water is produced at virtually all oil wells, whether the wells were hydraulically fractured or not. In fact, hydraulic fracturing is not used in the Hunton Dewatering Play in central Oklahoma, yet it is one of the largest producers of salt water in the United States (Walsh and Zoback, 2015). 4. Misconception: Induced seismicity only occurs close to the injection well and at a similar depth as injection. Correction: Seismicity can be induced at distances of 10 km or more away from the injection point and at significantly greater depths than injection. In the classic case of injection-induced seismicity at the Rocky Mountain Arsenal, seismicity was induced at distances of at least 10 km laterally from the well and at depths of at least 4 km greater than the depth of injection (Healy et al., 1968; Herrmann et al., 1981; Hsieh and Bredehoeft, 1981). More recent reports have argued that seismicity may be induced at 20 km or more from the injection point (Keranen et al., 2014). 5. Misconception: All injection wells (hydraulic fracturing, wastewater disposal, and enhanced oil recovery) induce earthquakes. Correction: Most injection wells do not cause felt earthquakes. There are approximately 35,000 active wastewater disposal wells, 80,000 active enhanced oil-recovery wells, and tens of thousands of wells are hydraulically fractured every year in the United States. Only a few dozen of these wells are known to have induced felt earthquakes. A combination of many factors is necessary for injection to induce felt earthquakes. These include faults that are large enough to produce felt earthquakes, stresses that are large enough to produce earthquakes, the presence of fluid pathways from the injection point to faults, and fluid pressure changes large enough to induce earthquakes. It is likely that some of these criteria are not met in areas that have very few or no earthquakes that may be induced by wastewater injection, such as theWilliston Basin in North Dakota (Frohlich et al., 2015), the Michigan Basin, and the Gulf Coast of Texas and Louisiana (Weingarten et al., 2015). More injection wells may be inducing earthquakes, but current studies are limited to the largest earthquakes and those with the best seismological and industrial data available. Further study of other earthquake sequences may reveal that additional felt earthquakes are induced. It is likely that smaller induced earthquakes are occurring and are too small to detect. In some sense, all hydraulic fracturing induces earthquakes, although typically microearthquakes. When production engineers hydraulically fracture, they are intentionally cracking the rock, causing microearthquakes that are typically smaller than M 0. 6. 6. Misconception: Wells injecting at zero injection pressure at the wellhead (i.e., wells where the formation readily accepts fluid without requiring the fluid to be pushed into the formation) cannot induce earthquakes. Correction: Wells injecting under gravity feed (i.e., wells where you can pour fluid down the well without added pressure) increase the fluid pressure within the injection formation and thus can induce earthquakes. For example, 2 Seismological Research Letters Volume 86, Number 4 July/August 2015 SRL Early Edition the vast majority of wells in the Raton Basin are injecting under gravity feed and have induced an earthquake sequence that is ongoing since 2001 and includes an M 5.3 earthquake and an M 5.0 earthquake (Barnhart et al., 2014; Rubinstein et al., 2014). In the seismology community, triggered has an additional meaning: earthquakes caused by earlier earthquakes are triggered by the previous earthquake (Freed, 2005). This process applies to natural and man-made earthquakes alike. To avoid any confusion between the two kinds of triggered earthquakes, we suggest using induced exclusively to describe all anthropogenic earthquakes, and we have done so in this article. Accordingly, triggered refers to the physical interaction between parent and daughter events, whether natural or anthropogenic in origin. HYDRAULIC FRACTURING Invented in 1947 (Hubbert and Willis, 1957), hydraulic fracturing (often colloquially referred to as fracking), is a technique that has been used for decades in the oil and gas industry. Approximately one million wells were hydraulically fractured in the United States between 1947 and 2010 (Gallegos and Varela, 2014). Hydraulic fracturing is a technique that aims to improve the production of wells by increasing the number of and extending the reach of fluid pathways (i.e., fractures) between the formation and the well. Hydraulic fracturing achieves this by injecting fluid, typically water, at high pressure into low-permeability rocks, such that the fluid pressure fractures the rocks or stimulates slip across pre-existing faults or fractures. Increasing the fracture density and extent of the fracture network enhances fluid flow and allows for more distant fluids to be accessed by a well. In addition to fluid, a propping agent (e.g., sand) is injected to keep the newly formed fractures open. Following hydraulic fracturing, which takes a few hours to a few days, there is a period where the hydraulic fracturing fluid is allowed to flow back to the surface where it is collected for disposal, treatment, or reuse. Subsequent to flow back, the wells begin production (i.e., the extraction of oil or gas begins). At first, vertical oil wells were hydraulically fractured to increase production. Then, in the 1990s, extended reach horizontal drilling technology was developed. This allowed drillers to steer wells more precisely such that they could remain within narrow horizontal and subhorizontal oil and gas reservoirs over great distances. This enabled production along the length of the well within the production formation. This technology. The geology in these diagrams is simplified from natural situations in which there are many more rock layers. Arrows show the directions of fluid being injected or withdrawn. Arrow color indicates the contents of the fluid: black (oil, gas, and wastewater), yellow (oil and gas), and blue (wastewater). (a) For a period of hours to days, fluids are injected at high pressure into a production well. The pressures are high so that the rock surrounding the well fractures and the permeability is increased. Increased permeability allows the extraction of oil or gas from a larger region. This technique of high-pressure injection is known as hydraulic fracturing. Following the hydraulic fracturing of a well, the well goes into production. (b) Production wells extract oil and gas from the ground. Some, but not all, production wells are hydraulically fractured. (c) Production wells extract oil and gas, and as a byproduct, salt water. The salt water is found in the same formation as the oil and gas and is commonly termed “produced water.” The oil and gas are separated from the produced water, and the produced water is injected into a deeper formation with the disposal well. In practice, the wastewater from many production wells is injected into a single injection well. (d) An alternative to wastewater disposal is enhanced oil recovery. In enhanced oil recovery, produced water is injected into the formation holding the oil and gas. The injection of produced water is intended to sweep oil and gas that is close to the injector toward the production wells to enhance oil recovery. combined with hydraulic fracturing, unlocked gas and oil resources in tight formations (e.g., shales) and is largely responsible for the recent boom in gas and oil production in the United States. In some sense, hydraulic fracturing is intended to cause earthquakes, albeit very small, in that the intent is to fracture the rock. These intentionally produced earthquakes, often termed microseismic events, are typically on the order of −3:0 ≤ M ≤ 0 (Warpinski et al., 2012). In cases when hydraulic fracturing induces earthquakes of larger magnitudes, the earthquakes are likely the result of the reactivation of nearby pre-existing faults (Maxwell et al., 2010). Despite being invented in 1947, the first report of a felt hydraulic fracturinginduced earthquake was in 1991 (Kanamori and Hauksson, 1992). Since 2011, a number of other earthquake sequences with felt earthquakes induced by hydraulic fracturing have been reported (Green et al., 2012; Holland, 2013; Friberg et al., 2014; Skoumal et al., 2015). The largest hydraulic fracturing induced earthquakes to date are two ML 4.4 earthquakes in central west Alberta and northeast British Columbia (BC Oil and Gas Commission, 2014). In these cases, the total injected volumes were remarkably high for hydraulic fracturing (e.g., 630,000 barrels or 100; 000 m3 for both ML 4.4 earthquakes; H. Kao, personal comm., 2015). Waste fluids are often a byproduct of many oil and gas extraction operations. At times these fluids can be cleaned and reused or applied for other purposes. In other instances they are unsuitable for other uses and must be disposed. When waste fluids must be disposed, they are often injected deep underground into high-permeability formations, usually deeper than the production reservoirs, for permanent sequestration and isolation from oil/gas reservoirs and drinking-water aquifers . The wells in which these fluids are disposed are known as wastewater wells or salt-water disposal wells. Underground disposal of wastewater has a lengthy history because it is typically considered an economic and safe option (Ferguson, 2015). The contents of wastewater can be highly variable. In some places, it is primarily spent hydraulic-fracturing fluid (e.g., Ohio and Arkansas), whereas in other locations wastewater often consists mostly of formation brines that come to the surface at the same time as the oil and gas that is extracted. For instance, in Oklahoma, only 10% of the fluid injected into disposal wells is spent fluid that was initially used in hydraulic fracturing and cannot be reused (Murray, 2013). These formation brines (also termed produced water or wastewater) are typically salt water that is trapped in the same pore space as the oil and gas and comes up with the oil and gas. This salt water is often laden with dissolved salts, minerals, and occasionally other materials that make it unsuitable for other uses. Injection rates of disposal wells range widely, with some wells injecting 100 barrels (16 m3)/month and other wells with rates exceeding one million barrels 160; 000 m3=month. The Denver earthquakes of the 1960s, caused by injection of chemical waste at the Rocky Mountain Arsenal, were the first earthquakes to be identified as related to deep, underground injection (Evans, 1966; Healy et al., 1968). The largest earthquake in the sequence was M 4.9 (Herrmann et al., 1981). Many more injection-induced earthquakes have been identified since this sequence, the largest being the August 2011 M 5.3 Trinidad, Colorado, earthquake (Rubinstein et al., 2014) and the November 2011 M 5.6 Prague, Oklahoma, earthquake (Keranen et al., 2013). Enhanced oil recovery is a suite of injection techniques used by the oil and gas industry to allow or encourage more oil and gas to be produced from a reservoir than would come out on its own (Murray, 2013) . The techniques typically involve the injection of water, steam, or carbon dioxide into the production formation. Water flooding (the injection large amounts of water) improves production by sweeping the oil and gas toward the production wells. The injection of steam and carbon dioxide is undertaken to improve production by reducing the viscosity of oil. Enhanced oil-recovery operations typically aim to keep the fluid pressure in the reservoir at or below its original level. Many cases of enhanced oil recovery-induced earthquakes have been identified (see Nicholson and Wesson, 1992 and references therein). In fact, one of the best documented cases of injection-induced earthquakes was from water flooding near Rangely, Colorado (Gibbs et al., 1973; Raleigh et al., 1976). Because this field had an extensive history of induced earthquakes from enhanced oil recovery, it was selected for an experiment in earthquake control by the U.S. Geological Survey. Raleigh et al. (1976) demonstrated that by varying the fluid pressure at depth, they could control whether or not earthquakes were induced. The largest earthquake known to be induced by enhanced oil recovery is an M 4.6 earthquake in the Cogdell field near Snyder, Texas (Gan and Frohlich, 2013). There are many ways in which human activities induce earthquakes (e.g., reservoir impoundment, fluid injection, fluid extraction, and mining). (4) fluid stresses holding the fault closed (the normal stress), resulting in a lower effective stress. With lower effective normal stress clamping a fault, the frictional resistance to slip is lower and the fault is more prone to slip. The effect of fluid injection on fault failure is illustrated with a Mohr-Coulomb diagram, which shows a failure envelope for a typical compressive medium. As pore pressure increases, the Mohr circles shift to the left and closer to the failure envelope. If the faults are suitably oriented with respect to the local stress field, they may slip and cause earthquakes. In addition to the fluid pressure in candidate faults, there are many other factors that influence whether or not injection will induce earthquakes. These include injection parameters (e.g., cumulative injected volume, injection rate, injection pressure, fluid temperature, and injection depth) and reservoir conditions (e.g., pore pressure, temperature, rock strength, the presence of pre-existing faults and their orientation relative to the local stress field, and reservoir permeability; Shapiro and Dinske, 2009; Zoback, 2012). Many of these parameters are not easily constrained or are unknown, which makes it difficult to determine the wells that will induce earthquakes and those that will not. Most often, faults reactivated by injection activities were unmapped before the earthquakes illuminated them. WHICH METHOD OF FLUID INJECTION HAS THE HIGHEST LIKELIHOOD OF INDUCING DAMAGING EARTHQUAKES? Hydraulic fracturing, long-term wastewater injection, and enhanced oil recovery have all induced earthquakes in the United States and Canada in the past few years (Horton, 2012; Gan and Frohlich, 2013; Holland, 2013). As discussed above, wastewater disposal is responsible for the vast majority of the increase, including the largest and most-damaging induced earthquakes (Horton, 2012; Keranen et al., 2013; Frohlich et al., 2014; Rubinstein et al., 2014). Here, we explore why wastewater disposal is responsible for this change. It is probable that the duration of injection, the magnitude of the fluid pressure increase, and the size of the region affected by injection will strongly influence whether earthquakes will be induced and how large they will be. Larger fluid pressure changes are more likely to induce earthquakes than smaller pressure changes, larger volumes of injected fluid increase the probability of a large fault being affected by the fluid pressure change, and a longer duration of injection gives earthquakes a longer time window during which they can nucleate. A quick examination of the above factors suggests that wastewater injection into previously undisturbed formations is more likely to induce felt earthquakes than hydraulic fracturing. Although the higher injection pressures suggest that hydraulic fracturing would be more likely to induce earthquakes than wastewater disposal, the duration of injection and the total volume of injection of hydraulic fracturing is much smaller than wastewater disposal. Wastewater disposal wells typically operate for years or decades, whereas hydraulic fracturing lasts Shear Stress Normal Stress σ1 σ1 σ ′ 3 Failure Envelope σ3 ′ C T P 0 . Mohr circle diagram showing the effect of increased fluid pressure on a fault. Normal stress on the horizontal axis (compression when positive and tension when negative) and shear stress on the vertical axis. The maximum and minimum normal stresses acting in any given location are plotted as σ1 and σ3, and a Mohr circle (shown in red) is drawn to represent the range of stresses acting on a plane at one location, showing both the shear and normal stress at a given location. When fluid pressure (P) is increased, normal stresses are reduced by P, resulting in new normal stresses σ′ 1 and σ′ 3, moving the Mohr circle to the left by P (purple). This also means that the Mohr circle is closer to the failure envelope and makes shear or tensile failure more likely. Observations and numerical modeling indicate that increased fluid pressure within faults most strongly influences whether an injection well will induce earthquakes (Raleigh et al., 1976; Shapiro and Dinske, 2009; McClure and Horne, 2011). It is critical to note that the injected fluids need not travel the entire distance from the injection well to a fault for the injection to affect the fault’s behavior. Injection can affect a fault’s behavior via the change in fluid pressure, which can be transmitted greater distances than fluids themselves. Like stepping on the brakes in a car, the increase in the fluid pressure that is initiated at the well (or brake pedal) is transmitted to the fault (brakes) without the fluid traveling the full distance between the well and fault. As fluid is injected into a reservoir, the fluid pressure within that reservoir rises. If this fluid pressure increase is transmitted to a fault. Wastewater disposal wells also inject far more fluid than hydraulic fracturing, so they affect a much larger region. The largest hydraulic fracturing treatments inject approximately 250,000 barrels (Gallegos and Varela, 2014) over the course of a few days; in the United States there are well over 1000 disposal wells that inject 100,000 barrels/month or more (Weingarten et al., 2015). Within a matter of months, all of these wastewater disposal wells will greatly exceed the volumes injected by even the largest hydraulic-fracturing operations, which implies that they are more likely to induce earthquakes. By virtue of its longer duration and larger injection volumes, wastewater injection is more likely to induce earthquakes at a greater distance and over a longer time span than hydraulic fracturing and thus, is a much more important source of induced earthquakes than hydraulic fracturing. Wastewater injection into undisturbed formations is also more likely to induce earthquakes than injection for enhanced oil recovery. The durations and volumes for both kinds of wells are similar. The difference between these wells is that enhanced oil recovery injects large volumes of fluid into depleted reservoirs where oil and gas have already been extracted and recycles produced water such that the pressure within the injection reservoir rarely exceeds the preproduction level. In contrast, wastewater injection is injected into virgin formations and thus raises the pore pressure from their initial levels. Avoiding pore-pressure increases within reservoirs reduces the likelihood of enhanced oil-recovery operations inducing earthquakes. These considerations are in accord with observations. Wastewater injection is associated with all of the largest injection-induced earthquakes (Horton, 2012; Frohlich et al., 2014; Keranen et al., 2014; Rubinstein et al., 2014), and there are many more reported cases of wastewater injection-induced earthquakes in the past five years in the United States alone (Frohlich et al., 2011, 2014; Frohlich, 2012; Justinic et al., 2013; Kim, 2013; Block et al., 2014; Keranen et al., 2014), and yet there are only approximately 35,000 wastewater disposal wells that are active in the United States. This is in contrast to hydraulic fracturing, which is far more common (1:8 million treatments over ∼1 million wells, 1947–2010 in the United States; Gallegos and Varela, 2014) than wastewater disposal wells, and yet there are only three reported cases of hydraulic fracturing-induced earthquakes in the United States (Holland, 2013; Friberg et al., 2014; Skoumal et al., 2015) and only a few more worldwide (BC Oil and Gas Commission, 2012, 2014; Green et al., 2012; Farahbod et al., 2015). Likewise, enhanced oil recovery is quite common (∼80; 000 active wells United States; Weingarten et al., 2015), yet there are few recent earthquakes associated with it (Gan and Frohlich, 2013). Results from modeling analyses also support the notion that wastewater injection is more likely to induce large earthquakes. The injection pressure, pressure within the field, duration of injection, and volume of rock affected by injection all influence the likelihood of inducing earthquakes (Langenbruch and Shapiro, 2010; Bachmann et al., 2011; McClure and Horne, 2011). The recent increase in injection-induced seismicity is caused by a corresponding increase in wastewater disposal in the central United States. The earthquake rate increase in Oklahoma, where the vast majority of the increase has occurred (585 of 688 M ≥3 earthquakes in the central United States in 2014), corresponds to a doubling of the wastewater disposal rate in the state from 1999 to 2013 (Walsh and Zoback, 2015). Focusing on the areas of increased seismicity within Oklahoma, we find that injection increased by factors of 5–10 (Walsh and Zoback, 2015). Other areas of increased rates of induced earthquakes also experienced sudden increases in wastewater disposal (Frohlich, 2012; Horton, 2012; Frohlich et al., 2014; Keranen et al., 2014; Rubinstein et al., 2014). (3) oil produced from many fields with large volumes of produced water did not involve any hydraulic fracturing. Similarly, enhanced oil recovery does not play a major role in the increase in seismicity, likely because operators attempt to keep fluid pressures in the reservoir balanced with the fluid pressure prior to production. Accordingly, wastewater disposal is responsible for inducing the majority of the earthquakes. Increased fluid pressure is the probable driving mechanism to induce earthquakes, and of the three aforementioned processes, wastewater disposal wells can raise fluid pressures more, over longer periods of time and over larger areas, than either of the other injection methods. Although seismicity associated with salt-water disposal has caused damaging earthquakes, we have not yet seen a catastrophic event or fatalities. Preliminary results in a number of areas of induced seismicity indicate that the earthquake hazard in these areas is comparable to the hazard in areas more traditionally known for earthquakes, such as California (Petersen et al., 2015). The increase in hazard is undoubtedly of concern and efforts to assess the hazard from induced earthquakes are ongoing. Fortunately, some authors have suggested that there is hope for mitigating the likelihood of damaging earthquakes through detailed seismic monitoring, careful selection of injection locations, variation of injection rates and pressures in response to ongoing seismicity, and a clear management plan (Zoback, 2012; McGarr et al., 2015; Walters et al., 2015). Mitigation of hazard from future-induced events, however, requires a detailed understanding of the physical processes involved in inducing large magnitude events and a detailed understanding of the geology and hydrology at the site of the earthquakes. (3) industrial data: injection rates and downhole pressures sampled and reported frequently. Managing the likelihood of induced earthquakes is an ambitious, but possible task that will require collaboration between scientists, industry, and regulators. Four Students Shot at Oklahoma School. See Prophecy: Deathstar City. WIRE:12/ 07/1999. Police: Teen-ager used father's gun in attack. FORT GIBSON, Okla.
McALESTER, Oklahoma (AP) -- Defense attorneys for Oklahoma City bombing conspirator Terry Nichols shifted the focus of his murder trial to John Doe No. www.greatdreams.com/concentration.htm - Similarto CONCENTRATION CAMPS IN THE U.S.? www.greatdreams.com/penaltyb.htm - Similarto SHOULD THE DEATH PENALTY BE ABOLISHED? NEW WORLD ORDER. OKLAHOMA CITY BOMBING. PHILADELPHIA EXPERMENT. P.O.W.S / M.I.A.S. PRINCESS DIANA DEATH. POPE PAUL VI IMPOSTER? Sep 11, 2001 ... Just before the Oklahoma Bombing... Governor Keating's brother wrote a book about a Federal Building being blown up there by terrorists. La Harpe in 1719, after being in the now Oklahoma area, mentioned the tribe as " Quataquios" living on the Arkansas River as neighbors of the Tawakoni. ... currently building, largely out of old discarded tires and aluminium cans, on a beautiful forty-acre oak and cyprus sheltered hideaway in southern Oklahoma. Zora spent her youth in a log cabin, having traveled by covered wagon through Indian Territory from Missouri to Oklahoma with the Sooners. Her memories were . ... see," said Daryl G. Colyer, a Lorena businessman who has investigated hundreds of reported Bigfoot sightings in Texas, Oklahoma, Arkansas and Louisiana. ... than any nomadic tribe other than the Kiowa), the Apache Tribe of Oklahoma is the modern name by which members of this small tribe wish to be known. Feb 16, 2008 ... ... of Georgia to the then "Indian Territory" of Oklahoma after the Supreme Court of the United States ruled the Cherokee treaty rights inviolate. Eventually, the Chiricahuas (who managed to survive the disease and neglect in the East) were sent to Oklahoma, where Geronimo died in February 1909. The Indians of Oklahoma-Part 2 - A Comprehensive History-All Other ... The Flag of the Ottawa Nation of Oklahoma .... Peoria Tribe of Indians of Oklahoma. Jul 28, 2006 ... Only 28 percent of normal rainfall fell in Oklahoma City between September and January, according to National Weather Service data. 82,299, 4.4. Choctaw, 61,936, 3.3. Mississippi Choctaw, 2,187, 0.1. Oklahoma Choctaw, 17,305, 0.9. 6, Pueblo, 52,939, 2.8. Acoma, 3,677, 0.2. Hopi, 11,173, 0.6. And we experienced the work of Timothy McVeigh in 1995 when he bombed the OklahomaMurrah Building. I couldn't just lay there in bed and let that go. May 14, 2013 ... 2.7 Oklahoma, McLoud. 2.2 Utah, Howell. 2.1 Nevada, Schurz. 2.0 Arkansas, Atkins. 3.1 California, Isla Vista. 3.7 California, Canyondam. Mr. Short's body was allegedly found in Grand Lake in Delaware County, OKlahoma even though eye color, hair color and dental records did not match. Jan 10, 2000 ... Sometimes I don't recognize the event specifically until after it has happened, such as the Oklahoma bombing, and the death of Princess Diana. Feb 22, 2014 ... 9/11/2001. ILLUMINATI. MILITARY. MIND CONTROL. NEW WORLD ORDER. OKLAHOMA CITY BOMBING. PHILADELPHIA EXPERMENT. ... INTO STORMS AND TORNADOS AND FLOODS IN ARKANSAS, OKLAHOMA, AND TEXAS. SEE: http://www.greatdreams.com/weather/floods-2008.htm. After visiting folks in Oklahoma recently and witnessing their greatest tornado ever, our friend Pila finds this term apt. As one of the spokesmen for our . Norman, OK: University of Oklahoma Press. LCCN 67-15571. ^ Johnson, Shelton , Shadows in the Range of Light, <http://shadowsoldier.wilderness.net>. terrorists coming from the north in crop dusting planes? www.greatdreams.com/north.htm - Similarto terrorists coming from the north in crop dusting planes? THE KING OF TERROR COMES TO SALT LAKE CITY? Aug 11, 1999 ... The massive tornado that leveled parts of Oklahoma earlier this year was rated as possibly an ``F5,'' with winds at 261 to 318 miles per hour. PRINCE WILLIAM GROWS UP - WHAT IS TO COME FOR HIM? Feb 20, 2012 ... McCain, Cox, and Paulus examined the link between overcrowding and general mortality rates in the Texas and Oklahoma prison systems. Aug 1, 2011 ... ... part of Denison before the Red River rerouted...so now the town is inOklahoma...is completely without water...and it is 107+ temps everyday. Jun 1, 2014 ... The May 8, 2003 Oklahoma City Area Tornadoes. Two tornadic supercells produced four tornadoes during the afternoon hours of May 8, 2003. Nov 17, 2012 ... Start watching immediately and this new earthquake energy will also have to cross Ohio, Chicago, Illinois, St. Louis, and Oklahoma first. ... Kentucky, Louisiana, Mississippi, Missouri, New Mexico, North Carolina, Ohio,Oklahoma, Pennsylvania, South Carolina, Tennessee, Texas, and Wyoming. They are Oklahoma City, Oklahoma; Kansas City. Missouri; and Bay City, Michigan. The Blue Highway Markers on the back of the highway signs lead to them. indian affairs: laws and treaties. treaty with the apache, 1852. Feb 27, 2012 ... SCHOOL SHOOTING - FORT GIBSON, OKLAHOMA. (AP) _ A 13-year-old boy who opened fire on his middle school classmates used . Was New Orleans' Hurricane Katrina disaster another deliberately created "spike " event in the same vein as the Oklahoma City Bombing and NYC's 9-11? ... state, tribal, local and private sector facilities in FEMA Region VI, which includes the states of Arkansas, Louisiana, New Mexico, Oklahoma and Texas. Feb 7, 2004 ... holding the tall white man hostage with a gun. I was thinking he was a politician. The white man said, "Where's Oklahoma?" I pointed . Sep 11, 2001 ... Elohim City is a "religious" community in Oklahoma where paramilitary types of the Aryan movement have been given weapons training. May 14, 2014 ... IN TEXAS AND OKLAHOMA, THERE WILL BE THOUSANDS OF HEAD OF CATTLE. IN POOR AREAS WILL BE TO TO 10 THOUSAND HOGS. ... along Interstate 35 from Mexico to the Oklahoma border, according to a new report from WND columnist Jerome Corsi, the author of "The Late Great USA.". Oklahoma, Rep, McCain, 122748, Huckabee, 110486, Romney, 83918, Paul, 11179, Giuliani, 2412. Dem, Clinton, 228425, Obama, 130057, Edwards, 42718.
www.greatdreams.com/nwo.htm - Similarto THE NEW WORLD ORDER -WHAT IS IT? Sep 5, 2015 ... Bombing Survivor Stories - 2 · Congressman Frank Lucas, U.S. House of Representatives, 6th · FEMA: Oklahoma City Bombing Archives. A theatrical production set on Oklahoma State University's cus is sure to shed some light, said local Christian leaders. The fourth annual Heaven's Gates. It's more spectacularly tragic than the Titanic, the Hindenberg, Oklahoma City, car bombs, and airplane hijackings. The number of deaths in one four-hour . Jun 5, 2014 ... The cluster shot up from western Oklahoma on June 23, so large that it was visible from Ashcraft's observatory in New Mexico 289 miles away:. Oct 23, 2012 ... ... part of Denison before the Red River rerouted...so now the town is inOklahoma...is completely without water...and it is 107+ temps everyday.